Amaranth Quartet is committed to presenting music of all eras with equal enthusiasm and artistry. Comprised of violinists Emily Botel and Abigail Shiman, violist Julie Michael, and cellist Helen Newby, the group was founded in 2014. Rooted in the San Francisco Bay Area, Amaranth performs frequently on a variety of concert series and festivals including the Presidio Sessions, San Carlos Eclectic Music Festival, Bay Area Modern Music Festival, Old First Concerts, and the Kronos Festival. They have appeared at prominent Bay Area venues such as Herbst Theater, SFJAZZ, the Fillmore, Freight and Salvage, and Yerba Buena Center for the Arts. Amaranth has toured throughout North America and has been featured as quartet in residence at the Banff Centre, New Music on the Point, and Lake Tahoe Music Festival, where they performed as soloists with the festival orchestra. The quartet has worked with a number of established and emerging composers including Sahba Aminikia, Ashley Fure, Tania León, Christian Wolff, Aleksandra Vrebalov, and Ryan Brown. Amaranth has performed alongside Ursula Oppens and JACK Quartet. The 2018-2019 season features the premieres of commissioned works by Sahba Aminikia, D. Riley Nicholson and Alyssa Weinberg, as well as appearances on the Shenson Chamber Music Series and Mills Music Now. Amaranth is passionate about mentoring young chamber music groups. They have coached at Palo Alto Chamber Orchestra Camp and at schools throughout the Bay Area. In 2018 Amaranth will conduct an educational performance residency in Lake Tahoe and launch their inaugural string quartet camp in San Francisco. Amaranth was recently selected as the sole recipient of Intermusic SF’s first Cypress Award, given to a musical project that strives to make an educational impact throughout the Greater Bay Area. Formed at the San Francisco Conservatory of Music, members of the quartet also hold degrees from Bard College, Cleveland Institute of Music, McGill University, Oberlin Conservatory, and the University of Michigan. Amaranth Quartet has had the privilege of working with the Kronos, JACK, Mirò, Cypress, Ives, Concord, and St. Lawrence String Quartets. Amaranth Quartet is fiscally sponsored by InterMusic SF. 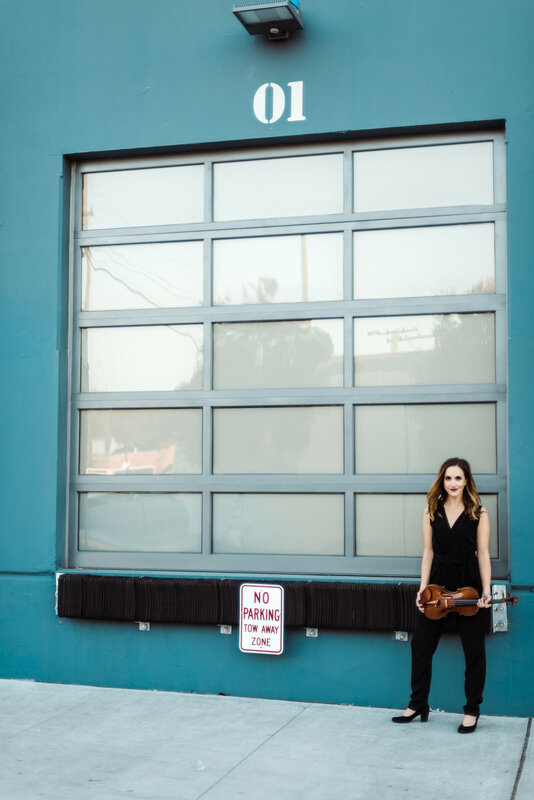 Born in Philadelphia, Pennsylvania, violinist Emily Botel has performed throughout North America and Europe with the belief that music is a powerful tool to create connection and community. She is passionate about reaching new audiences through small ensemble and chamber orchestra performance. Emily is a founder and violinist with the unconducted, chamber orchestra One Found Sound, the baroque ensemble Musa and is a member of the San Francisco Chamber Orchestra. Emily has appeared as soloist with the San Francisco Academy Orchestra and has performed at various festivals such as Aldeburgh, Banff, National Repertory Orchestra, Lake Tahoe, Spoleto USA. Emily earned a Bachelor of Music degree from the Cleveland Institute of Music, a Master of Music degree from the San Francisco Conservatory of Music and an Artist Diploma in Orchestral Studies as a member of the San Francisco Academy Orchestra. Emily has coached the Palo Alto Chamber Orchestra, taught at the Enriching Lives through Music program in San Rafael and in Belize, as a fellow with the organization MusAid. Emily is a registered Suzuki teacher and has a private teaching studio in San Francisco. Emily is also a registered yoga teacher and enjoys finding ways to counter the hours of violin playing through activities like spontaneous dance parties, snacking, and frolics on beaches and mountains. Emily is a proud dog mama to Theo, the adorable toy Schnauzer. Theo loves quartet rehearsals at Emily's apartment, but hates the E string and double stops. Emily now wishes she played cello. Helen is teaching her. Violinist Abigail Shiman finds joy making music in collaborative ensembles with an intent to connect and engage audiences. She is a member of the unconducted chamber orchestra One Found Sound, a frequent Post:Ballet collaborator, and a regular performer with a variety of Bay Area bands. She has performed in a number of diverse venues across the world including The Fillmore, The Fisher Center for the Performing Arts, Stanford’s Anderson Gallery, Alte Weberei Ahrenshoop, and Viracocha. Abigail received her M.M. at the San Francisco Conservatory, where she studied with Ian Swensen. She has participated in the Colorado Quartet Summer Seminar, Colorado College Summer Music Festival, and International Orchestra Institute Attergau, and others. She received undergraduate degrees from Bard College in Violin Performance and German Studies, studying with Erica Kiesewetter and working closely with the Colorado Quartet. A passionate educator and Suzuki teacher, Abigail has been a resident teacher in the San Francisco Public Schools, a teaching artist at Summer Music West, a string coach with the Palo Alto Chamber Orchestra, and a teaching assistant at New England Conservatory’s Project Step Classes. She is presently on violin faculty at the Community Music Center of San Francisco. Violist Julie Michael strives to bring the same spirit of sincerity to the performance of music of all eras. A native of Columbus, Ohio, she can be heard performing with a variety of Bay Area ensembles ranging from sfSound to the San Francisco Chamber Orchestra. Her passion for new music has led her to collaborate with many composers, to participate in the Montreal Contemporary Music Lab, and to teach a course on contemporary chamber music at McGill University. A Suzuki-trained teacher and a certified Global Leader of the Youth Orchestra of the Americas, Julie has taught at the University of Panama as well as at a number of El Sistema-inspired programs in North America, including Harmony Project San Francisco. Julie holds degrees from the University of Michigan (B.M.) and McGill University (M.M., Graduate Diploma), where her principal teachers were Yizhak Schotten and André Roy. Continuing her education at programs such as Bowdoin International Music Festival and Tibor Varga Academy (Switzerland), she has studied with Carol Rodland, Nobuko Imai, and Jean Sulem. Helen Newby continually seeks ways to expand the technical and expressive boundaries of her instrument through close collaboration with other innovative performers, composers and artists. Helen's passion for collaboration and experimentation has led her to work with a number of both emerging and established composers, including Steve Reich, Chaya Czernowin, Marcos Balter, Sabrina Schroeder, Ashley Fure, and Marek Poliks, among others. Her premiere solo album, Dialogue, featuring commissions by David Bird, Danny Clay, Adam Hirsch, Kurt Isaacson and Haley Shaw, was released in early 2017 on Ephemeral Stream Recordings. Newby has performed with and alongside ensembles such as the JACK Quartet, San Francisco Contemporary Music Players, Eco Ensemble, Real Vocal String Quartet, One Found Sound, and the Barnes Ensemble, among others. She is a founding member of Amaranth Quartet and Chartreuse. Recent and upcoming collaborations with pop, electronic and indie artists include Magik*Magik Orchestra, Diana Gameros, Kendra McKinley, and Aish, among others. In addition to an active career as a performer, Helen is equally dedicated to teaching. She maintains a private studio in Berkeley and is on faculty at The Crowden School. Newby graduated in 2015 with a MM from the San Francisco Conservatory of Music and in 2013 with a BM from Oberlin College.